Over two years ago I stopped making rag rugs, pretty well, because it hurts my hand. The big pink and brown wavy rug, I am heartily proud of it - it is on a round table in my bedroom, the little table we keep photos of our kids on. But I haven't done anything much since then. The bodger used for rag rugs in particular gave me RSI. The speed shuttle was fine, though. I may one day set up my frame and do another rag rug but for now I am focussing on dressmaking and I am getting myself in gear for quilting too! I also lost interest in a lot of things like blogging when my father died in November 2013. When he collapsed in his bathroom and my mother was trying to call me, to my eternal shame I was out of touch collecting a sewing cabinet from an Ebay seller in Wiltshire. Since then I have upgraded to a bigger sewing cabinet, installed a table for cutting out on, and taken over my mother's Janome machine which is less than 10 years old and a bit superior to my old John Lewis machine. I have now made quite a lot of clothes, mostly very simple Sewaholic tops - 3 Oakridge blouses, no fewer than 5 - FIVE!! Renfrew tops with cowl necks which I love to bits and wear all the time! 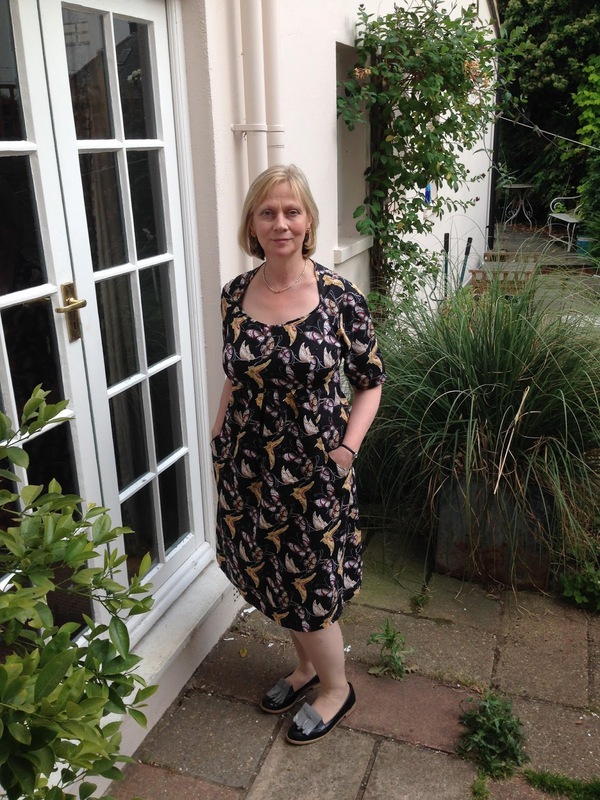 Today I finished off a really smart classic dress using Simplicity 1586, an "Amazing Fit" pattern. I used size 16, C cup and Curvy fit pieces and added six inches to the skirt length, which was otherwise just above the knee. 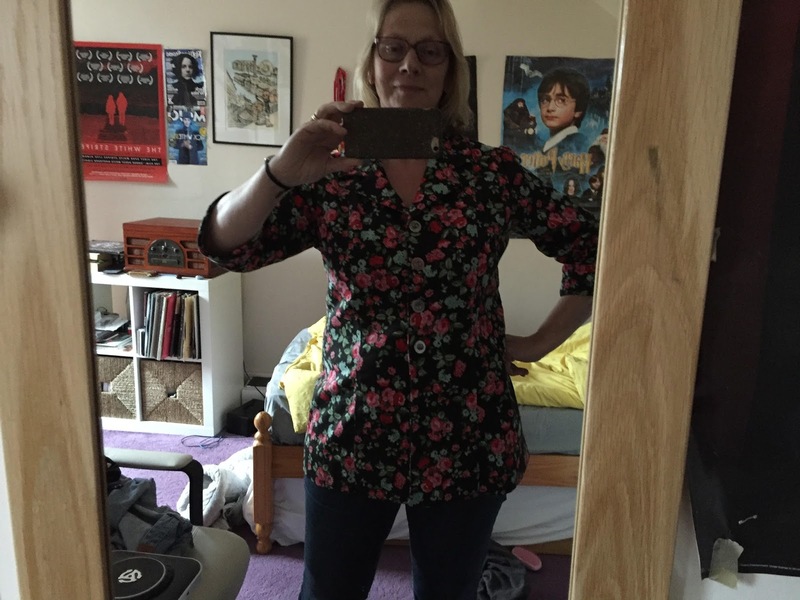 As well as the good fit round the hips I am pleased with the neckline and I put this down to the fact that I staystitched the neckline AND armholes. I also took a bit of trouble finishing off the seam allowances with my serger, because this lightweight grey suiting is very fray-ish. First, a jacket made last Christmas which started out as a shirtdress. The stretch cotton twill was too heavy for a dress, and it dawned on me I don't even like shirtdresses so with the help of a lovely sewing teacher in Ealing I shortened it to a jolly, flowery hip-length jacket. Wore it to parties last Christmas. Everything has been for me, except I made a simple little pinafore in navy corduroy for Edith. She wants a gypsy blouse but hasn't got round to giving me the fabric she bought for it yet. 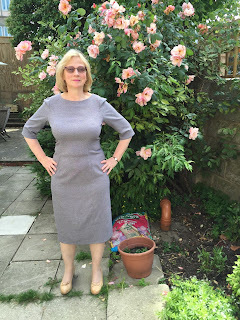 I haven't felt I am getting better at dressmaking but when I look at that grey dress and compare it with the thing I made a year ago, which was another Amazing Fit pattern, I think I might have got a bit better. I think my fabric choice and pattern placing skills are improving. This label is sewn into my proudest achievement so far - a Janet Pray Jacket Express in a lightweight cotton twill. 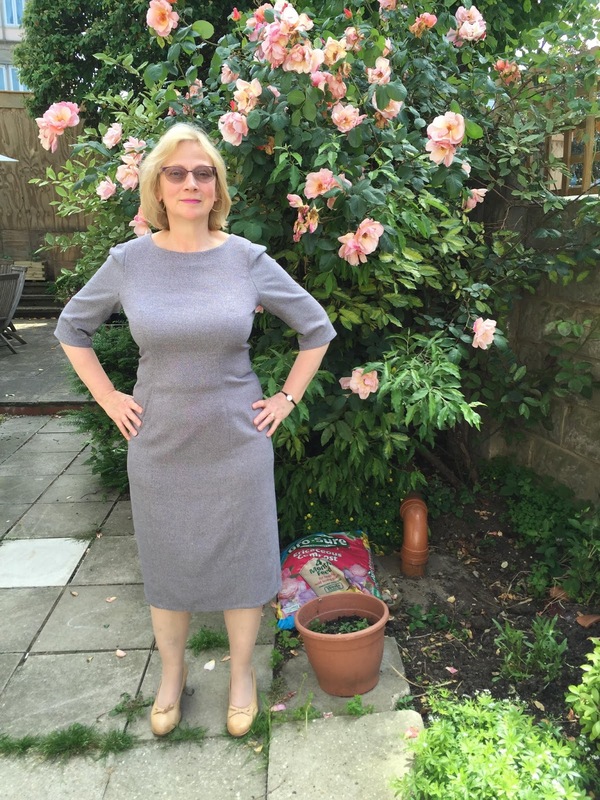 Like the grey suiting I bought this fabric on spec at the London Sewing and Knitting Show in Olympia two years ago. It's so cute and I am so proud of the jacket as it is by far the most complicated garment I have ever sewn in 42 years of sewing! It deserves a blog post of its own. As does my serger....Later perhaps. I am absolutely amazed at how many pieces you made! 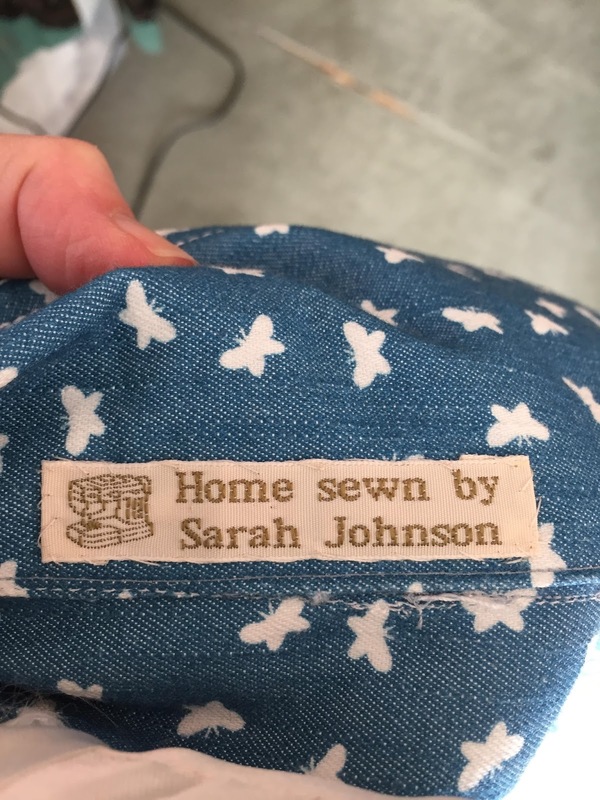 I wish I had as much sewing mojo, I am very envious! I think the grey dress is beautiful. The fit looks amazing! (I do love that pattern range but haven't been nearly as successful at actually getting a good fit. More practice needed!). 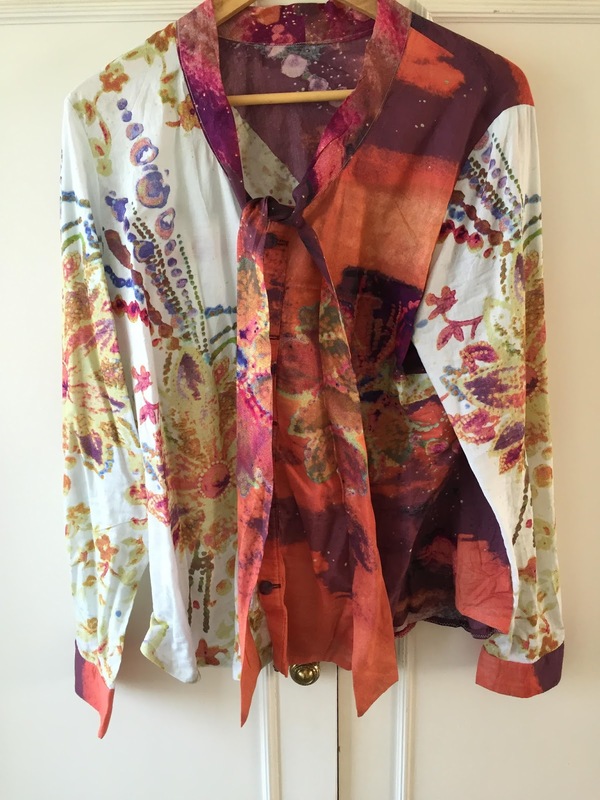 I also love the Oakridge blouse, very gorgeous! I like the grey dress so much, I would love to see some detail photographs and a close-up of the fabric. That would be fantastic. I am so glad you're enjoying dressmaking, that's so good to hear. Very motivating! I am very sorry about your father, it is really awful to lose someone. Sending you best wishes.